If there is any character in contemporary film that completely models a High Conflict Personality/empathy-disordered individual, it is the portrayal of the Joker by Heath Ledger in the movie “The Dark Knight”. In fact, the portrayal was so accurate, it screwed Ledger up so much that he didn’t survive the role. A sleeping disorder, described by Ledger as an inability to quiet his mind (just a guess — but he decalibrated his sense of time so much by playing a psychopath, it was impossible for him to regain control) led to an interaction overdose accident. Why does The Joker in one scene say “Kill the Batman” and at the same time demand money from the Mob in order to do it? This is a perfect example of egocentric v-Meme borrowing from his audience. While he may have no real interest in seeing the Batman dead, he knows the Mob does. Equally as well, he knows the Mob won’t believe him if he offers to do it for free. He has to tell them he wants money — enough to make them hurt — if he wants credibility. In a twisted way, he is using Rational Empathy to connect to his audience using the v-Memes that they understand. More than anything else, this clip shows that the Joker, even though he is anti-empathetic, is a master of empathetic reasoning, moving up and down the Spiral at will. He understands exactly the Authoritarian/Legalistic system that he’s interacting with — and how to make everyone in it crazy. Another amazing aspect of this scene, though, is showing the disordered and collapsed sense of time the Joker possesses. At the end, when he presses the gun up against his own forehead, the Joker is making a profound statement about extent of time that matters. He’s collapsed all of his desires into one, impulsive moment. Not only can we understand the Joker, but we relate to his experience. We engage in rational and emotional empathy! The Joker: Oh, you look nervous. Is it the scars? You want to know how I got ’em? The Joker: …to myself. And you know what? She can’t stand the sight of me! She leaves. Now I see the funny side. Now I’m always smiling! 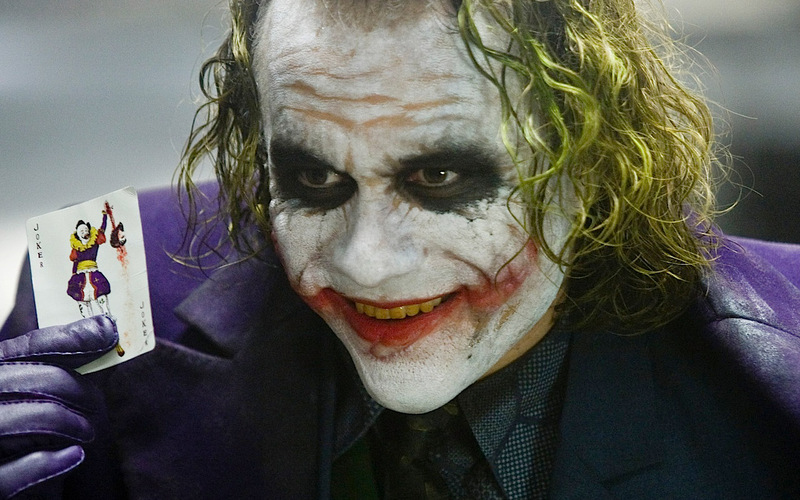 From a v-Meme perspective, the Joker is, at a minimum, forcing the audience in the cocktail party to accept him as an individual, playing off communitarian sensibilities. In fact, it could be the Joker is presenting himself in even a more profound role — that of a self-aware criminal! But here’s the rub — every act of transference that occurs from the audience is reversed in the movie. And here is the key — if you’re not a psychopath, you likely can’t think like one. That is not the way to manage your relationships with them. What to do? Believe it or not, the Buddhists have the best answer. When I originally posted this, I thought we could get through understanding the Joker in one post. But that’s not the case. We’ll get to those Buddhists. But we have a little more exploration to do with the Joker. Takeaways: The Joker is the iconic psychopath. With some aggregate of functional timescales, ranging from the pure impulsive, to the long-term plan, the disordered mind of the Joker keeps everyone guessing. His most powerful weapon, though, is distortion of the mental models and assumptions that others believe to be the case. The best weapon against the Joker? Well-reasoned collection of data, and rational thought. Because when you’re dealing with the Joker, you need to remember that no one’s going to be better at using your own mental models, supplemented by your own confirmation bias against you and your team.